William Morris, (1834-1898) perhaps best known now for his wallpaper designs, though in his lifetime he was thought of most highly by the public as a poet who dabbled in other things - and dabble he did. His legendary work rate and breadth of interest and imagination led him to work in many fields; interior design, furniture making, tapestry work, dyeing, embroidery, architecture, stained glass, tiling, painting, illustration, book design, typography & printing. And although his writings and work inspired a whole generation of architects and craftsmen, not to say utopian dreamers and ordinary men & women, he himself never attempted to set up a community based on his ideals. He was tempted on a number of occasions. At The Red House at Bexleyheath, built for Morris by the architect Phillip Webb, he had planned to extend the house into a quadrangle and even commissioned drawings when it looked like fellow artist Edward Burne-Jones and his family would come and join him. Later when looking for a site to set up the workshops for Morris & Co he scouted the the half-deserted Cotswold village of Blockley with the view to setting up an Arts & Crafts based community at the abandoned silk mill there. He was persuaded against the move by his business partners, something he later regretted. He set up at Merton Abbey, near Wimbeoldon instead. Finally, in the later years of his life at Kelmscott, (the house he rented on the upper reaches of the Thames), he would hold gatherings of political and artistic colleagues who would plot the creation of a new world. Among those who gathered in the Thames-side drawing room was the elderly Owenite E.T. Craig, veteran of Ralahine and the Chartist agitation. At the end Morris proclaimed a sort of Marxist-based anarchism that ruled out setting up ideal communities until after the revolution. Others saw no need to wait for the revolution and inspired by Morris set about reorganising existing society. The Guild of Handicraft which opened its doors in Whitechapel in 1888 was the brainchild of a young architect Charles Robert Ashbee. Whilst a trainee at the office of architect G.F.Bodley, and living at Toynbee Hall, Ashbee was influenced not only by the ideas of Morris & Ruskin, but also met Edward Carpenter, philosopher of the simple life and proponent of `homogenic love'. The Guild grew out of lectures Ashbee gave on Ruskin to the 'BWM', his shorthand for the British Working Man. Frustrated by the well-intentioned philanthropy of Toynbee Hall "neither a college, convent nor a club" he conceived of a more practical experiment, a craft 'co-operative' modelled on English Medieval Guilds, where skilled craftsmen working by the principles of Ruskin & Morris would not only produce hand-crafted goods, but also run a school for young apprentices. 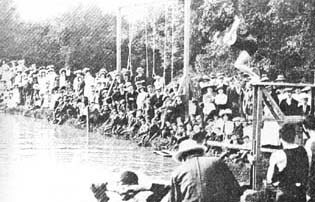 The idea was greeted with great enthusiasm by almost everyone except Morris himself, who was by now deeply involved in promoting revolutionary socialism. In an attempt to win his support Ashbee declared, "look I am going to forge a weapon for you;- and thus I too work for you in the overthrow of society", to which Morris replied, " The weapon is too small to be of any Value." Ashbee, like Morris before him was a rich boy turned revolutionary. His mother came from a wealthy Jewish family in Hamburg and his father was a senior partner in a London law firm. Despite Morris's discouragement Ashbee pushed on with both the Guild & School of Handicrafts opening in rooms at Toynbee Hall on June 23rd 1888. The venture was a surprise success and shortly moved to larger premises on the top floor of a nearby warehouse and then onto a rather grand Georgian house in Mile End Road and open a shop in the West End to sell the Guild's goods. At Essex House the Guild carried out carpentry, carving, cabinet making and decorative painting . A smithy was built in the garden and metalwork, silverwork & jewellery were added to the Guild trades. Ashbee's success in Whitechapel was based partly on his own developing architecture practice, with the guild providing the furniture, fixtures and fittings for a growing number of commissions. Other factors contributing to the success were no doubt the contact with the wealthy patrons of Toynbee Hall and the success of other young Arts & Crafts architects, supplied by the Guild. A lively social life was established at the Guild with programmes of lectures, and Guild suppers, where the men sang songs and acted in masques. 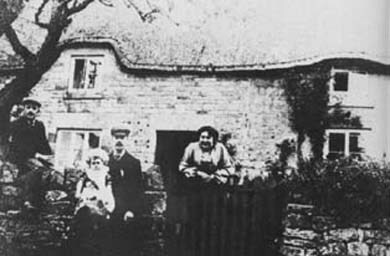 An Essex House cricket X1 was formed and a number of country cottages were acquired to which the guildsmen would cycle for weekend breaks and short holidays. Inspired by the Guilds example, and the British Arts & Crafts movement in general, others made attempts to emulate them throughout Europe and America. Following a visit to Morris's workshop at Merton Abbey in 1895 the American Elbert Hubbard founded the Roycroft community at East Aurora, New York. Hubbard was considered something of a conman. However his community survived until the depression of the 1930s producing an extensive line of crafts and providing its workers with decent housing and recreational facilities. Somewhat better thought of was the work of Gustav Stickley. Initially inspired by seeing Shaker furniture exhibited at the 1876 Centennial Show in Philadephia, Stickley would go on to become one of the leading Arts & Crafts practitioners in the US, developing a distinctive America style known as 'Mission Furniture'. Stickley did not believe in a slavish adherence to handworking and used machines in an attempt to produce what he called 'democratic' furniture that was affordable to a wide range of customers. To a certain extent he was successful in this. Where others relied on rich patrons Stickley managed to reach a wide audience through his influential magazine, The Craftsman and through extensive use of mail-order catalogues. In 1898 he established workshops at Syracuse organised on Guild lines and renamed his company The United Craftsmen. Later plans to establish a community and model farm in New Jersey failed after the company went bankrupt following the purchase of a skyscraper in New York. One of Ashbee's commissions led directly to the formation of a community at Darmstadt in Germany. 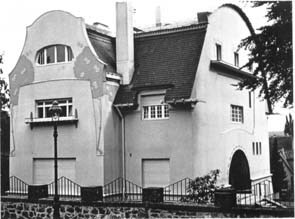 Following work by Baille Scott & Ashbee to the palace of the Grand Duke of Hesse, the Duke sponsored the building of a series of artist studios and houses on his estate. Meanwhile back in Britain Schools of Handicraft and Guilds were proliferating across the country. Schools had been set up in Birmingham, Glasgow, Edinburgh & Dublin. A friend of Ashbee, Godfrey Blount set up The Haslemere Peasant Industries in I896 in Surrey. It was an umbrella organisation for a number of small craft workshops employing local skilled labour. Blount and his wife Ethel Hine were concerned with reviving local craft traditions and included weaving & embroidery alongside the by-now-standard crafts of woodwork, metalwork, bookbinding & handprinting. Their aim was; `the revival of a true country life where handicrafts and the arts of husbandry shall exercise body and mind and express the relation of man to earth and to the fruits of earth'. 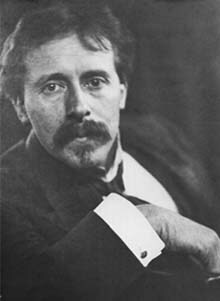 At the peak his success in Whitechapel in 1898 Ashbee married Janet Forbes, an accomplished musician who would bring a female dimension to the Guild's so-far-male, comradely atmosphere. Janet Ashbee would take an active role in the working of the guild; the Ashbee's marriage being a remarkably 'equal' partnership. Women were involved in the Arts & Crafts movement not only in traditional female crafts like weaving & embroidery, but also others such as bookbinding, with a Guild of Women Bookbinders being based in London. Mary Watts, wife of the painter G.F. Watts, directed a women's pottery guild at the Compton pottery. In the USA a successful women artists' community, Cogslea, was founded by Violet Oakley. At Ditchling in Sussex Ethel Mairet pioneered new weaving designs. Gertrude Jekyll, the garden designer & writer carried out much of her work in conjunction with Arts & Crafts architects. And May Morris, having worked alongside the old man himself, went on to produce original embroidery works of her own, becoming a figurehead for craftswomen in England and leading to the setting up in 1907 of the Women's Art Guild. The Song of the Builders of the City of the Sun. Comrades, our city of the sun! Beneath her grey and solemn skies. Here stands our city of the sun! The journey from Mile End Road to Chipping Campden appeared to some of the men as a journey from the dawn of the 20th century back to the closing of the 16th century. What had been an affluent market town made prosperous by the wool merchants of the 1400s was by Ashbee's day a somewhat sleepy rural backwater, little changed since Sir Baptist Hicks had burnt down Campden House to stop it falling into Cromwell's hands during the Civil War. The picturesque stone buildings and air of semi-dereliction fitted the Guild's own mythology of a revival of a lost mediaeval England so well that they were unable to see their arrival as part of a ongoing cycle of rural depression and revival, the town not being quite as sleepy as was made out. The arrival of some 150 Eastenders did however have a significant impact on the small town. The Guild moved out to the country over a number of months, workshop after workshop being installed one at a time into the Old Silk Mill now renamed Essex House. On the ground floor went the Essex House Press, set up with the presses from Kelmscott acquired on Wiliam Morris's death. Alongside the press were the drawing offices and showrooms. On the floor above went the jewellers and on the top floor the carpentry workshop, with the blacksmith's shop being set up in the yard. The mill was set in its own garden and orchard and had installed the first electric lighting in the town. A 'Hall of Residence' was established for the single men in Braithwaite House and various cottages were rented for those with families. Ashbee took a house in the centre of town renaming it somewhat grandly the Woolstaplers Hall. Apart from a few of the men who grew homesick and returned to London the guildsmen thrived in the town. Almost as soon as they had settled in, visitors started to arrive curious to see this little island of utopia in the English countryside. The locals on the other hand didn't quite know what to make of this invasion from the metropolis: in the first place some were openly hostile with local shopkeepers overcharging the newcomers and others resentful at having been evicted from their homes to make way for higher-paying outsiders. The wages paid by the Guild were always more than the local agricultural wage. The local gentry in their turn didn't quite know what to make of the Ashbees. Were they the proprietors of this new enterprise on their doorstep or not? Relations would become easier as the years passed and the Guildsmen became involved with the life of the town. As in the East End a range of social activities were arranged by and for the men and their families. 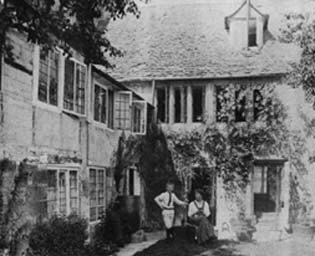 These were generally open to the local inhabitants, and ranged from the regular plays and lectures put on at Elm Tree House, to the Cotswold School of Handicraft which ran classes in cookery, woodwork, gardening, music and keep-fit. Much to the amazement of the town the 'lazy' village lads were organised by one of the men into a Harriers running club and later the Guild would build an open-air swimming pool for the town. And swimming would feature in the annual summer sports alongside football, hockey and cricket matches. Local people played in the townband set up and led by one of the Londoners. Two of the numerous visitors to Campden during this time were none other than the grand architects of Fabian socialism Sidney & Beatrice Webb, who had taken a nearby cottage whilst engaged in writing their epic history of local government. The irony of the Webbs writing on municipal state-run socialism in the midst of his rural arcadia was not lost on Ashbee who was highly amused by their visit. Another visitor was Ashbee's old mentor Edward Carpenter who came to give a lecture on Small Holdings and Life on the Land. In many ways the comradeship of the Guild with its genial company of young men enjoying themselves together came close to achieving Carpenter's ideal of 'homogenic' love between men, which was based on Ashbee's own barely-concealed homosexuality, which both he and his wife Janet came to terms with remarkably well, given that these were the years after the Oscar Wilde trial. Although the Guild produced some of its best work during the Campden years, financially some departments had been experiencing difficulties since they arrived. The jewellers and silversmith had been struggling against competition from semi-machine-made methods of other firms in London and Birmingham who produced goods much cheaper, and which to the customers' eyes were identical to the Guild's pieces. For the first time in its history the Guild as a whole recorded a loss in 1905. Trade had been low, with some men having been on short time during the year. There had been a general slump in trade that affected many independent craftsmen, not just the Guild, though the distance between Campden and the Guild customers was thought to have contributed to the loss of work. The Guild took the loss in its stride and carried on much as before, though belts were somewhat tightened and attempts made to be more competitive. The following year after poor sales of a hand-printed Bible the Essex House Press was forced to wind up: whilst the financial impact of closing the press was small, the symbolic loss of William Morris's printing machinery was great. The following years balance sheet, although not as bad as the previous showed another loss. The Guild was now on the brink of bankruptcy. Whilst it struggled on into the next year the measures to save it became increasingly desperate until finally it went into voluntary liquidation and was forced to sell its stock to pay its debts. Critics pointed to its utopian idealism as the root of its demise, but the Guild was sunk largely by the competition of machine made replicas available in such shops as Heals and Liberty's. The Guild had lasted in one form or another for some 21 years: no mean achievement for an experiment in workplace democracy and community building. Many of the Guildsmen stayed on in the Cotswolds; some of them taking up the offer of American soap magnate Joseph Fels who bought 70 acres to be divided into small holdings in neighbouring Broad Campden. In 1909 a less formal and looser Guild was set up by those men still working in the area. In the later part of his career Ashbee developed his ideas on Arts & Crafts, influenced by his friendship with the American architect Frank Lloyd Wright: ideas he expressed in his book, Where the great city stands published in 1917, in which he outlined his hopes for post war society. It contained plans for a co-operative Garden City at Ruislip. From 1917 to 1923 he worked in the Middle East, latterly in Palestine for the British Military Government, where he took over from Patrick Geddes the somewhat daunting task of quite literally building a new Jerusalem; an appointment that did not last, as Ashbee, though Jewish, was apparently stubbornly pro-Arab. Others would establish craft-based communities but never on the scale achieved at Chipping Campden. Edward Barnsley and Earnest Gimson created a loose community of craftsmen around their workshop at Sapperton. Members of the Scottish Arts & Crafts Movement were intrumental in the founding of a homesteading scheme at Stirling in 1909. Craftwork and the revival of 'traditional' crafts has played a significant and continuing role in utopian experiments and back to the land movements right up to the present day. Chipping Campden still looks much the same as it did in the days of the Guild and the Old Silk Mill still houses craftworkers along with a small museum of the Guild of Handicrafts.